Cedar siding can last decades and it requires little maintenance to retain its natural beauty. There is one thing you must do, however, to hold onto that warm wood glow, and that's restaining when your siding starts to look dull. Restaining your cedar siding involves removing the old protective coating and applying a new layer of wood stain in the color of your choice, then applying more protective coating. Restaining can be time-consuming, but it's easily enough done. Cedar siding has a warm, natural look. Clean the siding with a mixture of 1 part bleach and 4 parts water. Wash the entire surface with a dampened cloth, removing any traces of dirt and revealing the wood finish. Do not soak the wood. Rinse the surface with a second damp cloth and pat the siding dry with a dry cloth. Remove the existing finish with a power sander and 220-grit sandpaper. Work in small, circular motions to remove the protective finish. Sand the wood until all the finish coating is removed and the natural grain is fully revealed. The surface of the cedar should be smooth to the touch. Wipe the sanded surface of the wood with a clean cloth to remove any sawdust. Brush stain onto the siding. Use using multiple thin layers of stain for an even coating. Follow the grain of the wood and take care not to allow the stain to pool, as this will leave visible brush marks. Allow the stain to dry according to the manufacturer's instructions. Apply a second coat if a deeper stain color is desired. 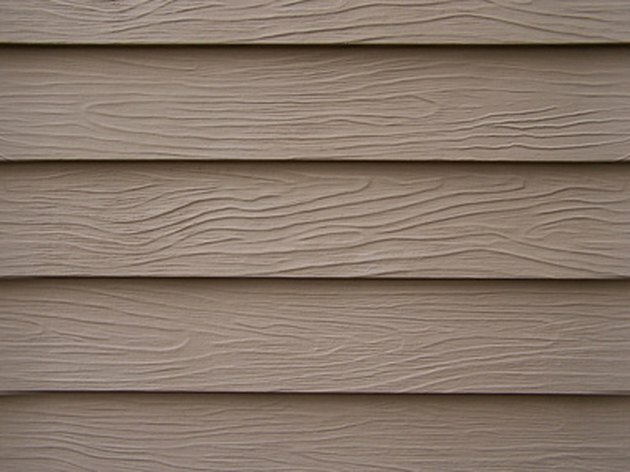 Seal the siding by brushing on a coat of clear polyurethane finish. Follow the grain of the wood as you did when applying the stain. Allow the finish to dry according to the manufacturer's instructions.